Germfree designs and manufactures laminar flow hoods customized for any pharmaceutical application. Our Unidirectional Airflow Cabinets are engineered for the specific demands of your process. We offer HEPA or ULPA filtration systems to meet ISO 5 (Class 100) as well as ISO 4 (Class 10) standards or up to EU GMP Grade A.
Biopharmaceutical production platforms often have unique configurations. Clean air workstations must be properly integrated with all other systems. Housing large equipment, special processes and other capacity considerations may require a custom solution. 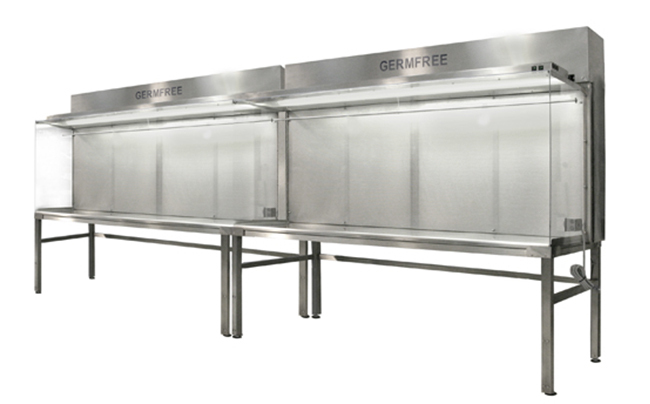 Germfree specializes in the integration of Unidirectional Airflow equipment and all air filtration systems that may be located in a cleanroom. We assure that all engineering controls are properly configured for a cGMP-compliant production facility/cleanroom. We offer a wide array of customizable specifications and features. The units are designed with the airflow patterns required for your process. Our laminar flow workstations can be outfitted with doors or other access features to surround any devices or equipment in the critical aseptic zone. Other options may include sinks, shelving, and special lighting. For example, we build custom units that are configured specifically for lyophilizers. 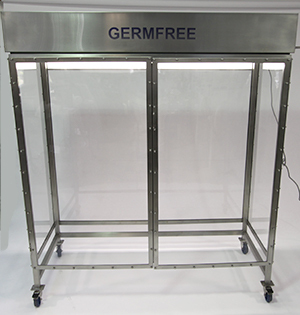 Germfree also manufactures Laminar Flow Downflow Booths. We can design and engineer downflow booths to provide both HEPA-filtration as well as any containment requirements for hazardous APIs. Contact our design experts about your specific biopharmaceutical application.